Everything is out of my closet that I showed you yesterday. Has anyone else found that the worst part of cleaning and organizing is really is that a BIGGER mess has to be made in order to clean up? Something does not seem right about that. After taking everything out, I repainted the closet a nice, clean white to make it a little fresher. I started my sorting while the paint dried. According to every organizing book I’ve read, we wear 80% of our clothes 20% of the time. Not sure if that is true, but it sounds good and gives us something to work with when we begin looking through all of our possessions. First you need to sort out the things that you know either don’t belong in your closet or that you are ready to part with because they don’t look good, are worn out or out of style, or just not something you want to keep anymore. (I actually did this step as I was removing things from my closet). From what is left, find the 20% that you wear 80% of the time….the things you love and feel comfortable wearing. (That is, of course, unless you’ve decided those items were better off in the previous pile, which is often the case with the clothes that we wear a lot. Ever watched What Not To Wear?) Since I had already figured out where things would go in my closet, I put these clothes back in (once the paint had dried). Unless you were great at purging in the first step, you probably still have a lot left, right? 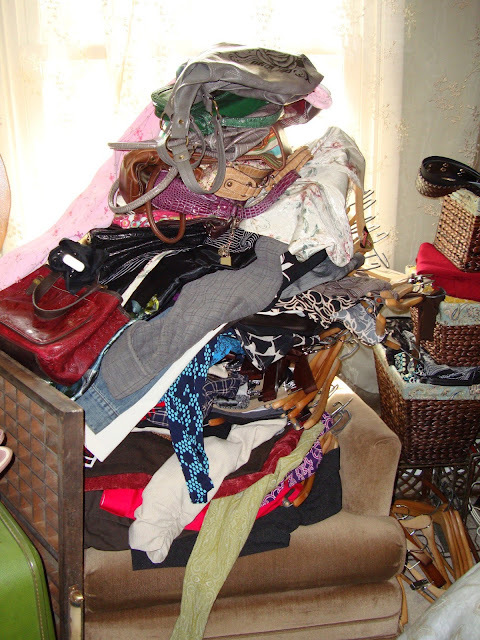 Find the items that you want to be added to your 20%, but stop when your closet is getting close to being filled. We all will continue to find things we want to buy, so there might as well be a little growing room left to fill. It is important to try everything on. There were quite a few clothes that I would have liked to have put back into the closet, but had to admit once I tried them on that they just don’t fit like they used to. Make sure what is going back into your closet deserves to be there and isn’t just taking up space. As for the shoes, make sure that they are still in good condition. Sort out the ones that need to be replaced or that you don’t wear anymore. Some of mine went because I had to admit to myself that they just aren’t very comfortable to wear. While putting the shoes back in my closet, I cleaned and polished the ones I was keeping so that everything in my closet is ready to wear. Check back tomorrow and see the results of my cleaning!